Andy B and I have a bit of a tradition. On Wednesdays, I’ll stop by his place on my way home from work. We’ll grab a cappuccino at the corner bar and then meander down to the local comic shop where I pick up my just-arrived monthlies. Andy B doesn’t partake in this exercise, however. He’s a buyer of collections which means that he waits for those monthly series of stories to be bound together in a hard or softcover format. That doesn’t stop him from spending money on impulse purchases each week, however. Don’t tell his wife – although I suspect she already knows. I really enjoy our Wednesdays together. I anxiously look forward to my weekly pull list, that excitement of seeing a comic cover for the very first time and taking it off of the shelf to read in the comfortable confines of home. Of course, I also enjoy the company of a good friend as we catch up on the action, intrigue and drama of our lives – or, at least, how the workday went. 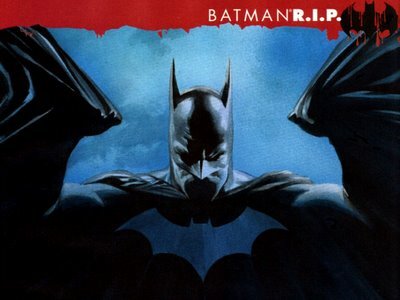 On November 26, 2008, the day of Batman #681’s release, the day that the final chapter of Grant Morrison’s highly anticipated Batman R.I.P story run would finally reach readers, the day I had really, really been looking forward to, Andy B, God bless him, bailed on me. As I lay in front of the television that November evening, flipping channels aimlessly, a deep need started to overtake me. Not knowing if it was a need for food or thought, I flitted from the refrigerator to the computer, perusing comic book websites with the same sense of purpose that I had with the remote control. Glaring reviews of Batman #681 stood out on every site, pleading for me to read them, to be spoiled, telling me how the story ended. Did DC Comics keep their promise? Did The Dark Knight die? Who killed him? Now, I love spoilers more than the average person does. It doesn’t bother me to know an ending in advance of seeing a film or reading a book. The journey is by far more important than the destination. I even tantalized myself on chat boards that contained threads titled: “THE BIG REVEAL IN BATMAN 681” or “R.I.P. Questions (spoilers)”. I actually started shaking with nervousness! I looked at my watch. It was 7:30 pm and the nearby mall – which just happened to have a small comic shop – was open until nine. I got in my car and headed out into the cold November night, speeding my way towards eagerly anticipated fictional brilliance. cruel. where are the spoilers for part 2? or would you rather star in “Japer R.I.P.,” a one-shot describing the fall of a would-be blogger of noble-repute.